"No we won’t give up the Day Jobs, but we won’t get off the stage. We groove on in the basement, refuse to act our age! " Rod Crundwell and Stafford Sanders met in first year high school 1965 - discovering a shared passion for music and Not Paying Attention. In the late 1970s they threw in their Day Jobs in an ill-advised tilt at fame, roping in Paul Fenton and Ken Stephenson too late to save the Sydney-based wannabe popstars from crashing and burning for all the usual reasons. But not before they wore sailor suits on Countdown and survived some bizarre experiences. After the breakup, Ken headed for Melbourne, designed software, played and produced with various bands and names – and of course set up BackPocket Records. Rod and Paul also kept playing, but in Sydney – with some top acts including goodtime rockers On The Prowl (formerly “Ol’ 55”), who also featured veteran bassist Kim Constable. Stafford veered into other forms of writing – journalism, radio and TV satire, and stage musicals – and more recently a published novel. Around 2000 Rod, Paul and Stafford reunited to form Men With Day Jobs - making two albums of their quirky originals: Men With Day Jobs (2004) and Dreams and Tinsel (2008), with Ken guesting. 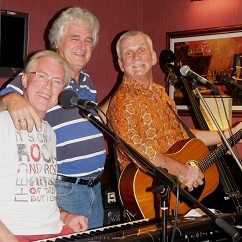 In 2008 Paul moved to Tasmania, and Rod and Stafford hit the Sydney semi-acoustic circuit. 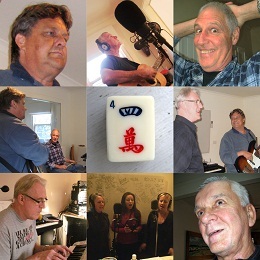 They all joined Ken in his Melbourne studio in 2010 to record their third CD, the Mah Jongg-themed 4 Characters. In 2010 Rod and Stafford invited Kim to join their live Sydney lineup. They’ve played some of Sydney’s best semi-acoustic venues, and won rave notices for their energetic, eccentric live sets at the Northern Beaches and Kangaroo Valley festivals (also presenting songwriting workshops) and in joint performances with the Solidarity and Ecopella choirs at public events. 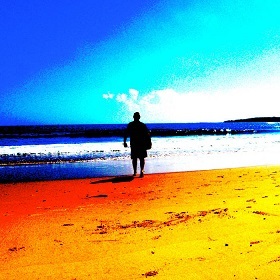 2014 saw them release an exuberant fourth album, Deep in Denial, followed in 2015 by a quirky surf EP Wiped Out Again – featuring old, new and reworked material. A fifth album, working title Selfies, is well on the way. The Men’s songs have been covered in the US and Canada and across Australia, sung by schools nationwide, and made finals of national song contests. In 2015 they returned to national TV – without the sailor suits – on NITV’s Marngrook Footy Show. See all their live and studio clips at www.youtube.com - search “Men With Day Jobs”. They also have a popular Facebook page. The Men continue to draw from a wide range of genres and inspirations. Their live performances mix melody, harmony and rhythm with stories, humour, audience involvement… and of course Not Paying Attention. While the Men appreciate your support, rest assured they won’t give up the Day Jobs again – at least, not until they have enough super to live on. Elegant, urbane Sydneyside exterior belies a shameless pop tart who flails at various keyboards - comes naturally from being raised on a diet of honky-tonk and Honky Chateau. Also plays some bass, cameos on electric guitar, mandolin and more. Tilts heroically at high harmonies. Plucks cute phrases and haunting snatches of melody from thin air and adds performance flair, classical, jazz and artsy influences. Craggy, daggy Sydney songwriter crammed with ideas, lists, stories and grand designs. By instinct more writer than muso, but gets nice noises from his old acoustic guitar, as well as rhythm and occasionally lead electric, percussives, lots of singing and onstage banter. Weighs in heavily with words, tunes and vocal arrangements. Raised on folk and pop, also frolics in funk, fusion and whatever else he can f**** up. Lured into the group in 2010 with promises of beer and groupies. Plays electric and upright bass, sings, writes and comes up with eccentric song ideas. Cheerful ex- tea-chest plunker (and presumably, plonker) with a variety of halfway decent names. Home pizza chef extraordinaire. Professional experience in managing seniors with chronic mental issues – so just the right man for this group. More than your usual cliché drummer-turned-guitarist, this Kiwi-turned-Sydneysider-fled-to-Cygnet, Tasmania. Bangs at percussives, guitar, bass and mouth harp. Sings mean and mostly low. Once conscripted into the 1970s wannabe pop group to add beefcake value, and more recently guested on the Men’s “Beached” studio clip for the same reason. Melbourne-based multi-instrumentalist, instrument maker, IT innovator, BackPocket maestro. Plays bass, lap steel, mandolin, a smorgasbord of guitars, and more; programs, engineers, fixes and hides things. Much experience with top names. Boyish exuberance thinly masked by practiced air of world-weary cynicism. A dry wit, a wry chuckle and a dash of Old Lady. On 4 Characters: Jo Kelly Stephenson, Julianne Jessop and Helen “HJ” Stephenson. On Deep in Denial: Beck Fielding and Russell Neal. More guests are being lined up for the next album, Selfies. The Men have collaborated in live performances with two choirs: singing their “Denial Tango” with Ecopella at the People’s Climate Rally, Sydney 2015; and with the Solidarity Choir, singing “I’ll Ride With You” at the Palm Sunday Rally for Refugees, Sydney 2016.